With Christmas being literally around corner, we all have our christmas stories. Whether it'd be getting that special gift, giving that special gift or just remembering the times you've had with your family and friends. I got my own Christmas stories to tell, maybe too many, to be honest. There's one I remember the most, its the one that makes me laugh and it reminds me of how much the memories of family means to me. Not bad for our first N64 game! This one begins two weeks before Christmas and the hottestest gift anyone wanted was a Nintendo 64, everyone wanted one. 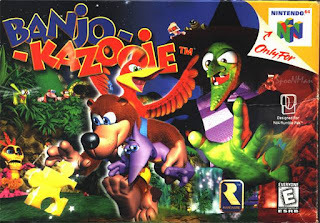 Since we weren't a wealthy family I remember my grandma helped my mom pay for the gift and it came in a package deal, we got the Nintendo 64, extra controller and the game Banjo Kazooie. I remember being extrememly excited that we were getting this game system and I couldn't hold it in and I had to tell my brother what we had gotten. At this time we were already off of school vacation and upon telling my brother he decided that it would be best to play right away. Now, me and my brother have a 4 year difference, I told him not to be stupid and that we couldn't play it because there was a plastic cover on our gift, because it was a package deal. He laughed in my face, pushed me out the way and with a razor blade slit the side of the plastic and took out the game system carefully, so that we wouldn't crease the plastic. We pulled it out everyday for two whole weeks without my mom ever having a clue because we would put the game system back at least an hour before mom showed up from work. Leading up to Christmas there was only one other person that knew what we were up to and that was my younger cousin, Jimmy, and he was getting a Nintendo 64 package deal too. So we were both excited and I had to one up him and tell him we were already playing ours. I'd soon find out that it was huge mistake. Christmas eve was finally here and as mom was gift wrapping, my cousin Jimmy happen to be at our house, helping my mom wrap up gifts. Finally, mom had gotten to our Nintendo 64 package and she was ready to wrap it up when good old Jimmy noticed that something was funny with the packaging. There was a slit and he decided it was a good idea to let my mom know. Now, my mom isn't the sharpest tool in shed but she knows exactly what me and my brother are capable of. She was more in shock to find out that we had already been playing the game for about two weeks, than to be upset because she said we would have gotten away with it had it not been for Jimmy snitching on us. Moral of the story? Do something devious??? DON'T TELL YOUR FAMILY!!! THEY'LL BE THE FIRST ONE'S TO RAT YOU OUT!! !